The House of Songs has announced that it will welcome Egyptian rock star, Ramy Essam, as part of its January 2018 showcase at Northwest Arkansas outpost, The House of Songs Ozarks. Essam will perform at Crystal Bridges Museum of American Art and at the University of Arkansas’ Faulkner Center on January 18th and January 22nd, prior to traveling to New York to observe the anniversary of the resignation of Egyptian ruler Hosni Mubarak. 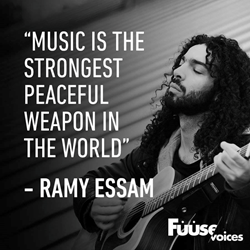 Ramy Essam is known as “The voice of the 2011 Egyptian revolution,” due to his songwriting and performances in Tahrir Square while calling for the resignation of then-ruler Mubarak. During his time of protest, Essam was beaten, arrested and tortured as a result of his outspokenness, with the intention of silencing him. His songs were banned, and he was forbidden to perform in a public setting. Ramy was offered a “safe haven” in Sweden in 2014, and began releasing new music with a rock influence. He remains a voice for the youth of Egypt, and a symbol of progression and social activism. On Thursday, January 18th at 6pm, Ramy Essam will participate in Crystal Bridges Artinfusion’s first Happy Hour + Happening program of the year, which will feature a Q&A session, moderated by Professor Gerald Torres of Cornell Law School at Crystal Bridges Museum of American Art. On Monday, January 22nd at 7:30pm, Ramy Essam will perform at the University of Arkansas Faulkner Performing Arts Center, which will be presented by The House of Songs Ozarks and The King Fahd Center for Middle East Studies. He will have interactive sessions with students, and an evening performance open to the public. Tickets are available through the Faulkner Center at http://faulkner.uark.edu. Essam will continue to New York January 23rd-25th and will participate in various interviews for the anniversary of the beginning of the Egyptian Revolution that took place January 25th, 2011. The House of Songs offers a place for international and local songwriters and musicians the opportunity to collaborate and retain their publishing rights to the work that is created in-house. The House of Songs invites songwriters from around the world to share the universal language of music in collaborations designed to bridge cultures, build friendships and cultivate peace. In 2017, The House of Songs announced its partnership with the Walton Family Foundation to bring The House of Songs Ozarks to the Northwest Arkansas region. The organization has established a new home in Bentonville to foster artist collaborations and engage in community outreach using the model established by the Austin House of Songs. The House of Songs participants have had internationally charted songs, have earned Grammy nominations and festival headlining slots, and have built lifelong bonds with musicians and fans. Envisioning international collaboration as the driving force for the future, The House of Songs uses music to open dialogues and build understanding and harmony.